Rumored to have once been a mortal man, Saint Cuthbert is an intermediate deity. Cuthbert of the Cudgel is the combative deity of Wisdom, Dedication, and Zeal. Cuthbert was the first Paladin in the lands of Oerth. He was not a servant of any one god, though he did pay homage to many of them, he was a servant of good directly. According to legend he was once a farmer who led his people from tyranny. Their practices and traditions had been stripped from them as foolish and they were being forced to follow their more “civilized” masters’ traditions. When Cuthbert freed them he reinstated the old ways, thus the church does not worship him or follow his teachings exactly but instead the old ways and traditions and pay the Saint reverance for his wisdom and aid to his people. Saint Cuthbert hates evil, but is more concerned with law and order, and preventing the traditions he cares so much for from vanishing. Saint Cuthbert is a foe of many evil deities, including Iuz and Vecna. Saint Cuthbert is strongly allied with Heironeous, and Pelor. He is an ally of Delleb and Rao as well. St. Cuthbert’s faith stresses the values of hard work, faithfulness to one’s spouse and family, respect for one’s elders and community leaders, and speaking plainly and openly about problems. They also preach the values of caring for one’s neighbor and helping the poor, stating that helping someone in need today prevents them from turning into a criminal tomorrow. People should strive to practice what they preach, providing a strong example to others in so doing. In that way the good of the community is strengthened, as goodness and common sense are spread to all. A central tenet of Cuthbertine faith is that parents, kings and other community leaders have a central role to play as leaders of virtue and honesty. Many Cuthbertine sects preach of a “social compact”: in return for service, allegiance and payment of money, rulers and leaders must always act in good faith on the trust put in them, and never break it. Rulers and leaders who break this trust or prove unworthy of it are, according to many Cuthbertines, worse than the most vile thieves and assassins, and deserve to be punished accordingly. The virtues of the Cuthbertine faith include many of the values stated above: charity, compassion, honesty, faithfulness, hard work, and keeping promises and oaths. St. Cuthbert is said to look favorably on those who maintain moral conduct in spite of whatever difficulties and problems a person may suffer, and refuse to give in to temptation. The Saint fought and lead his people so that they might worship in accordance with their ancient traditions as such all Cuthbertines worship and live their day to day lives in accordance with these traditions. A kippah (כִּפָּהיאַרמלקע) is a slightly-rounded brimless skullcap worn by many Cuthbertine men while praying, eating, reciting blessings, or studying Cutherbertine religious texts, and at all times by some Cuthbert men. In the modern Cuthbertine church women, especially the clergy, have also begun to wear kippot, however their are plenty of communities that are resistant to this change. Kippot range in size from a small round beanie that covers only the back of the head, to a large, snug cap that covers the whole crown. Tzitzit (צִיציִת) are special knotted “fringes” or “tassels” found on the four corners of the tallit (טַלִּית), or prayer shawl. The tallit is worn by Cuthbertine men and women during the prayer service. Customs vary regarding when a Cuthbertine begins wearing a tallit. In the Urnst community, boys and girls wear a tallit from bar/baht mitzvah age. In some Ulek communities it is customary to wear one only after marriage. A tallit katan (small tallit) is a fringed garment worn under or over the clothing throughout the day. In some Orthodox circles, the fringes are only allowed to hang freely outside the clothing. Tefillin (תְפִלִּין) are two square leather boxes containing holy verses, attached to the forehead and wound around the left arm by leather straps. They are worn during weekday morning prayer by observant Cuthbertine men and women. A kittel (קיטל), a white knee-length overgarment, is worn by prayer leaders and some observant traditional Cuthbertine on the High Holidays. It is traditional for the head of the household to wear a kittel at the Passover seder, and some grooms wear one under the wedding canopy. Cuthbertine males are buried in a tallit and sometimes also a kittel which are part of the tachrichim (burial garments). Traditionally, Cuthbertines recite prayers three times daily, with a fourth prayer added on the Shabbat and holidays. At the heart of each service is the Amidah or Shemoneh Esrei (תפילת העמידה “The Standing Prayer”) Another key prayer in many services is the declaration of faith, the Shema Yisrael (or Shema). The Shema is the recitation of a verse from the The Book of Laws (The Book of the Second Law 6:4): Shema Yisrael Adonai Eloheinu Adonai Echad—”Hear, O Flanaess! The Saint is our Protector! He Holds Us to our Way!" Cuthbertine holidays celebrate central themes in the relationship between the Saint and the world, such as creation, revelation, and redemption. Two braided Shabbat challahs placed under an embroidered challah cover at the start of the Shabbat meal. Shabbat, the weekly day of rest lasting from shortly before sundown on Friday night to shortly after sundown Saturday night, they use this time to commemorate their ancestors and to celberate the struggle of the Saint. It plays a pivotal role in Cuthbertine practice. At sundown on Friday, the woman of the house welcomes the Shabbat by lighting two or more candles and reciting a blessing. The evening meal begins with the Kiddush, a blessing recited aloud over a cup of wine, and the Mohtzi, a blessing recited over the bread. It is customary to have challah, two braided loaves of bread, on the table. During Shabbat Cuthbertines are forbidden from traveling or to engage in any activity that would traditionally be considered work. In fact the activities banned on the Sabbath are not “work” in the usual sense: They include such actions as lighting a fire, writing, using money and carrying in the public domain. The Saint reiterated the importance of the sabbath in the book of second laws. And the Saint spoke unto his People, saying: ’Verily ye shall keep the sabbaths, for it is a sign between me and you that throughout our generations we follow the path of our ancestors, that we know the path of our fathers’ and our fathers’ fathers’ and shall not be forced from it and forsake them. We shall keep the sabbath therefore, for it is holy unto us; for whosoever doeth any work therein, that soul shall be cut off from among his people for he does choose the side of our enslavers. Six days shall work be done; but on the seventh day is a sabbath of solemn rest, holy to the people of old and new; Wherefore the children of Flaness shall keep the sabbath, to observe the sabbath throughout their generations, for a perpetual covenant. It is a sign between Me and my children, and of you and your children, and of all the children of Flaness forever. The core of festival and Shabbat prayer services is the public reading of the Book of Laws, along with connected readings from the other books of the Tanakh, called Haftarah. Over the course of a year, the whole Book of Laws is read, with the cycle starting over in the autumn, on Simchat Tanakh. The holy days (haggim) of Saint Cuthbert, celebrate landmark events in Cuthbertine history, such as the war against their enslavers and the ascension of the Saint, and sometimes mark the change of seasons and transitions in the agricultural cycle. The three major festivals, Sukkot, Passover and Shavuot, are called "regalim.” On the three regalim, it is customary for Cutherbtines to make pilgrimages to Wintershaven to offer sacrifices in the Temple. Sadeh Lahham Reeshon is a week-long holiday beginning on the evening of the 14th day of Nisan (the first month in the Cuthbertine calendar), that commemorates the original uprising of the rebellion. It was during this time that the first battle with the Saint was engaged over the course of the eight day battle the uprising announced its presence. Reeshon is celebrated for eight days. It coincides with the barley harvest. It is the only holiday that centers on home-service, the Seder. Leavened products (chametz) are removed from the house prior to the holiday, and are not consumed throughout the week. Homes are thoroughly cleaned to ensure no bread or bread by-products remain, and a symbolic burning of the last vestiges of chametz is conducted on the morning of the Seder. Matzo is eaten instead of bread. Shavuot (“Pentecost” or “Feast of Weeks”) celebrates the apotheosis of the Saint. Also known as the Festival of Bikurim, or first fruits, it coincides with the wheat harvest. Shavuot customs include all-night study marathons known as Tikkun Leil Shavuot, eating dairy foods (cheesecake and blintzes are special favorites), reading the Book of Ruth – the Saints daughter , decorating homes and synagogues with greenery, and wearing white clothing, symbolizing purity. Sukkot (“Tabernacles” or “The Festival of Booths”) commemorates the struggle against their enemy and the War as a whole. It is celebrated through the construction of temporary booths called sukkot (sing. sukkah) that represent the temporary shelters the Saints army would have to seek. It coincides with the fruit harvest, and marks the end of the agricultural cycle. Cuthbertines around the world eat in sukkot for seven days and nights. Sukkot concludes with Shemini Atzeret, where Cuthbertines begin to pray for rain and Simchat Torah, “Rejoicing of the Torah,” a holiday which marks reaching the end of the Torah reading cycle and beginning all over again. The occasion is celebrated with singing and dancing with the Torah scrolls. The High Holidays (Yamim Noraim or “Days of Awe”) revolve around judgment and forgiveness. Rosh Hashanah, (also Yom Ha-Zikkaron or “Day of Remembrance,” and Yom Teruah, or “Day of the Sounding of the Shofar”). Rosh Hashanah is the Cuthbertine New Year (literally, “head of the year”), although it falls on the first day of the seventh month of the Hebrew calendar, Tishri. Rosh Hashanah marks the beginning of the 10-day period of atonement leading up to Yom Kippur, during which Cuthbertines are commanded to search their souls and make amends for sins committed, intentionally or not, throughout the year. Holiday customs include blowing the shofar, or ram’s horn, in the synagogue, eating apples and honey, and saying blessings over a variety of symbolic foods, such as pomegranates. Yom Kippur, (“Day of Atonement”) is the most solemn day of the Cuthbertine year. It is a day of communal fasting and praying for forgiveness for one’s sins. Observant Cuthbertines spend the entire day in the synagogue, sometimes with a short break in the afternoon, reciting prayers from a special holiday prayerbook called a “Mahzor.” On the eve of Yom Kippur (Erev Yom Kippur), before candles are lit, a prefast meal, the “seuda mafseket,” is eaten. Synagogue services on the eve of Yom Kippur begin with the Kol Nidre prayer during this festival Cuthbertines ask forgivness from eachother for wrongs done over the year. It is customary to wear white on Yom Kippur, especially for Kol Nidre, and leather shoes are not worn. The following day, prayers are held from morning to evening. The final prayer service, called “Ne’ilah,” ends with a long blast of the shofar. Hanukkah, חנוכה, also known as the Festival of Lights, is an eight day Cuthbertine holiday that starts on the 25th day of Kislev (Hebrew calendar). The festival is observed in Cuthbertine homes by the kindling of lights on each of the festival’s eight nights, one on the first night, two on the second night and so on. The holiday was called Hanukkah meaning “dedication” because it marks the re-dedication of the Temple after its desecration by Antiochus IV Epiphanes. Spiritually, Hanukkah commemorates the “Miracle of the Oil”. According to the Talmud, at the re-dedication of the Temple in Wintershaven following the completion of the holy coplex that stands there now. During the persession an unholy army assult the festivities during the battle all of the sacred oil was tainted by evil, there was only enough consecrated oil to fuel the eternal flame in the Temple for one day. Miraculously, the oil burned for eight days – which is the length of time it took to press, prepare and consecrate new oil. The pulpit, or amud (Hebrew, a lecturn facing the Ark where the hazzan or prayer leader stands while praying. In addition to synagogues, other buildings of significance in the Cuthbertine religion include yeshivas, or institutions of Cuthbertine learning, and mikvahs, which are ritual baths. The laws of niddah (“menstruant”, often referred to as “family purity”) and various other laws regulating the interaction between men and women (e.g., tzniut, modesty in dress) are perceived, especially by Orthodox Cuthbertine, as vital factors in Cuthbertine life, though they are rarely followed by Reform or Conservative Cuthbertine. Life-cycle events, or rites of passage, occur throughout a Cuthbertine’s life that serve to strengthen Cuthbertine identity and bind him/her to the entire community. Brit milah – Welcoming male babies into the covenant through the rite of circumcision on their eighth day of life. The baby boy is also given his Hebrew name in the ceremony. A naming ceremony intended as a parallel ritual for girls, named zeved habat, enjoys limited popularity. 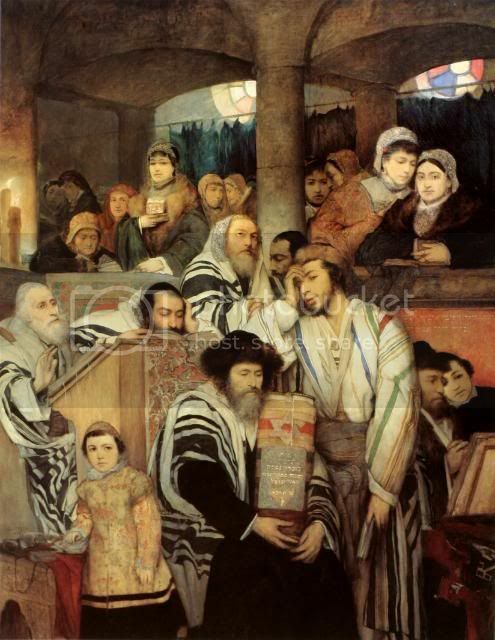 Bar mitzvah and Bat mitzvah – This passage from childhood to adulthood takes place when a female Cuthbertine is twelve and a male Cuthbertine is thirteen years old among Orthodox and some Conservative congregations. In the Reform movement, both girls and boys have their bat/bar mitzvah at age thirteen. This is often commemorated by having the new adults, male only in the Orthodox tradition, lead the congregation in prayer and publicly read a “portion” of the Torah. Marriage – Marriage is an extremely important lifecycle event. A wedding takes place under a chupah, or wedding canopy, which symbolizes a happy house. At the end of the ceremony, the groom breaks a glass with his foot, symbolizing the continuous mourning for the destruction of the Temple, and the scattering of the Jewish people. Death and Mourning – Cuthbertine has a multi-staged mourning practice. The first stage is called the shiva (literally “seven”, observed for one week) during which it is traditional to sit at home and be comforted by friends and family, the second is the shloshim (observed for one month) and for those who have lost one of their parents, there is a third stage, avelut yud bet chodesh, which is observed for eleven months. It is traditional to sit guard after one is dead to protect the body, in the Cuthbertine religion the body must maintain its purity. It is then baried whole no less the six feet below the ground. It is held that the Saint only judges those who have reached the end of their lives with purity this inludes the barial. St. Cuthbert’s is one of the most popular faiths among peasants and other members of the lower class for its rhetoric and teachings, which are both inspirational and easy to understand. Cuthbertines are frequently called upon to perform blessings and marriages, deliver and educate children, feed and clothe the poor and homeless, and provide counsel and service to those in need, freely dispensing services to people at all levels of society. Cuthbertines do not abide catcalls or mockery of their faith, as more than one smart-mouthed troublemaker has found out to his sorrow. They are openly and constantly seeking new followers, welcoming new arrivals to a town or city, or working among the poor and downtrodden, offering these people some meaning in their lives. Many beggars and other poor folk living in the most dangerous parts of a city frequently turn to the church of St. Cuthbert for protection and succor, as these fearless, club-wielding priests are more than ready to confront any criminal, thug or assassin that would dare to harm their charges. As such, the followers of St. Cuthbert take steps not only to discipline those among their flocks that sin, but also to try and battle the influences of those who would lead them to sin. To that end, they determinedly battle pimps, drug dealers, street gangs, extortionists, and others who would harm their charges, and also try to make life difficult for brothels, drug saloons, torture dens, and other disgusting establishments, which can sometimes get them into trouble with the authorities. The followers of St. Cuthbert are always seeking new converts, and constantly minister to the poor and sick, attempting to impress upon them the values and gifts of their god. Adventurers and other able-bodied folk will not usually receive service unless they are followers of the god, acting as agents for the church, or are in a truly life-or-death situation; even then, they will probably insist on a conversion or a substantial donation for doing so. Fortunately, many adventurers are devout Cuthbertines, and so often the clerics have no problem healing and restoring adventurers. When they shed their mortal coils, those who worshiped the saint in life go to Saint Cuthbert’s divine realm, called the Basilica of Saint Cuthbert or the Bastion of the Old Laws. This realm is in Arcadia. Souls there act as silent observers while the saint gives out judgments from his Seat of Truth. Saint Cuthbert seldom leaves his plane unless some great duty calls him forth. Cuthbertines are most prevalent in the central Flanaess. This is considered old Cuthbertine territory where the Saint actuallymarched alongside the people and led them to victory. The saint has churches in Dyvers, Furyondy, the Gran March, the Free City of Greyhawk, Keoland, Perrenland, the old Shield Lands, Tenh, the Principality of Ulek, the County of Urnst, the Duchy of Urnst, Veluna, and Verbobonc. These tempels can be as large as Pelorian cathedrals, but most commonly are wayside shrines and small tempels. The High Tempel of the Saint, the Hall of Justice, is builty alongside the High Cathedrial of Pelor, and the High Grange of Heironious in Wintershaven. The faithful are known individually as Mohel (Faithful), while parents and older members of the faithful community earn the prefix Rebbe (Wise Elder). Saint Cuthbert’s priesthood is divided into three major orders. The Chapeaux, whose symbol is a crumpled hat, seek to convert people into their faith. They are equally divided between lawful good and lawful neutral characters. Paladins of Saint Cuthbert, known as Votaries or Communicants, have an honorary position in the Order of the Chapeaux. Their role is not just to convert others, but to actually fight enemies of the faith. The Stars, whose symbol is a starburst, seek to enforce doctrinal purity among those already dedicated to the saint. The Billets are the most numerous of Saint Cuthbert’s clergy. Most are lawful good, and they seek to minister to and protect the faithful. These are well-beloved by the common folk. Their symbol is a wooden club. The Chapeaux often come into conflict with the Billets, because the former order wants to seek new converts while the latter wants to care for the worshipers they already have. There are a few lesser-known orders of St. Cuthbert. L’Ordre de la Croix-Rose Veritas, or the Order of the Rosy Cross of Truth, was founded in 587 CY), after the Greyhawk Wars. It was founded by Ormus, a former priest of Rao only just converted to Saint Cuthbert’s faith himself. When Ormus discovered an evil warlord had been corrupted by a devil in disguise, he founded the new order in order to track down other devils living among mortals in disguise. The order has three branches: La Croix-Vert, La Croix-Blanc, and La Croix-Bleu. The Society of the Sanctified Mind focuses on ridding the world of evil psionicists. It was founded circa 561 CY by a cleric of Saint Cuthbert named Sir Jeremy Costineux, after his home village was enslaved by illithids. This society is a knightly order rather than a strictly religious one, and people of a wide variety of character classes belong to it. Saint Cuthbert wields a powerful artifact called the Mace of Cuthbert. Other magic items associated with Saint Cuthbert include the cudgel that never forgets and the tabard of the great crusade.